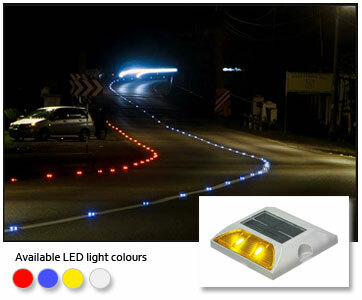 Solar road studs with LEDs are ideal and self sustainable way of illuminating paths on roads. Solar studs are fitted with small Mono or Polycrystalline solar panels. The power generated during the daylight is stored in Ni-mh battery which can run for more than 24 hours when fully charged. The studs have automatic on feature at dusk and off at dawn. The studs are rugged and can withstand pressure of 30 tons and temperature range of -25o C to 75o C.
The aluminum / polycarbonate die cast make gives the stud required strength for heavy load pressure.